It's actually powered by your phone! What’s sitting next to me isn’t a product that can you walk into an electronics store and buy—not yet, anyway. The NexDock, which looks like a laptop but isn’t, represents a possible future where phones become PCs. Instead, all of the available CPU power and app storage is provided by a mobile device, whether it be a Windows phone or tablet, an Android phone, a Raspberry Pi, or something similar. This “laptop” is more like an external monitor. Yes, it’s real: The $119 ($149 at retail) Indiegogo project was funded last week, making it a viable product. One of the founders, Emre Kosmaz, said the next step is to secure a visa to oversee the manufacturing in China. 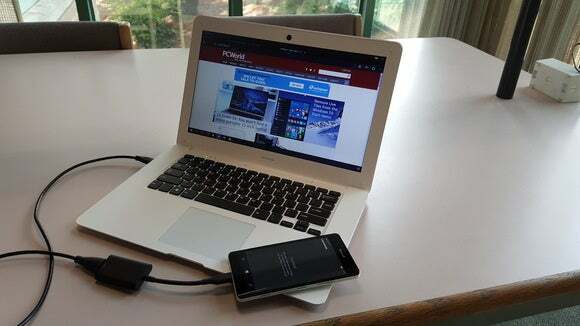 The NexDock can serve as a handy Continuum dock for Windows phones. 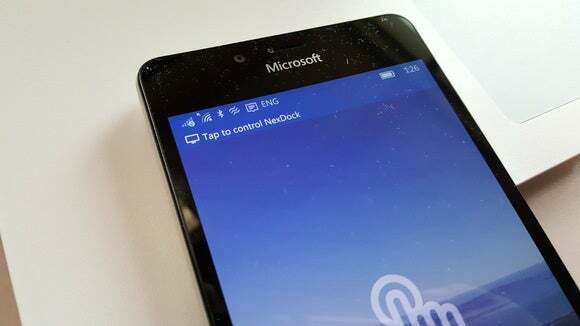 If this concept sounds familiar, you’re right: Both NexDock and Microsoft share a remarkably similar vision of phones evolving into the center of your computing landscape. 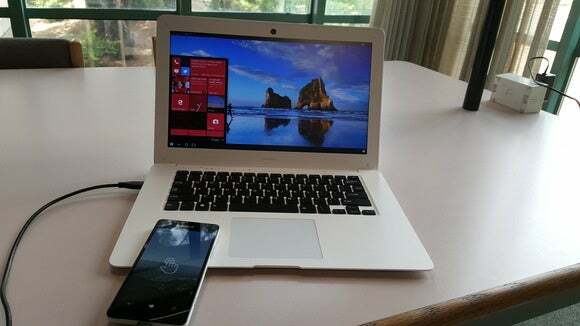 Microsoft’s Display Dock uses a USB-C connector to project the phone’s display upon a monitor, stretching apps like Mail or Word into full-screen replicas of a desktop experience using its Continuum technology. HP has a similar Desk Dock, plus a laptop-like Mobile Extender much like the NexDock, for its Elite x3 Windows phone. But HP's Mobile Extender screen is only 12.5 inches, while the NexDock's is 14.1 inches. Using the NexDock is extremely simple: You power it up, connect your phone to the external HDMI port (NexDeck supplied a USB-C to HDMI adapter, and you’ll need something similar) and you should see your phone’s display, writ large. While the NexDock doesn’t need to boot up, you’ll still need to turn on your phone’s Bluetooth to connect to the NexDock’s integrated Bluetooth keyboard and trackpad. I connected a Lumia 950 Windows phone, to better show off its Continuum capabilities. 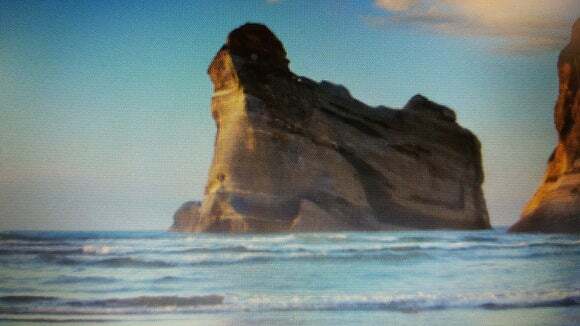 There are visible pixels on the NexDock screen. Right now, though, the NexDock is more interesting as a concept than as an actual product, especially when you compare the $99 Display Dock against the NexDock’s estimated retail price of $149. Touting itself as the “world’s most affordable laptop” goes a bit far, and only someone very forgiving will be pleased with the final build: The 1366x768 TN screen is mediocre, and the keyboard is mushy. A hardware bug forced me to place my phone in trackpad mode, otherwise the cursor would move at a crawl. Like the name suggests, it’s really a dock—complete with a pair of USB ports, a card reader, a pair of mics (but no speakers) and a headphone jack. The NexDock has a trackpad, but it’s easier to navigate by using your phone. Basically, you could reproduce the NexDock with a battery-powered external display and a Bluetooth mouse/keyboard combo. But the NexDock works, and it could be iterated upon, and if its backers or another company believe in the product, a future version of the Nexdock could evolve into something truly interesting. Inside the NexDock, for example, is a 10,000mAh battery that doesn’t do much except to power the display. Part of that has to do with the fact that a phone can’t be charged via an HDMI cord. 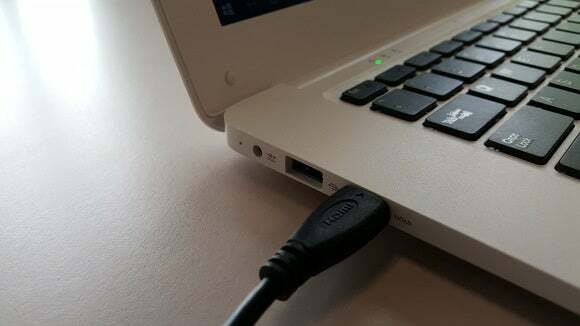 USB-C connectors, which have been built into the Lumia 950 and a small number of other phones, can do dual-duty as charging cords and I/O. Add a USB-C port, and the NexDock significantly improves. Ditto for an upgraded display. Today, this is an HDMI connection. Tomorrow, a USB-C? Each year, phones become thinner and thinner. This tends to irritate me, as I’d prefer a chunkier phone whose extra volume is filled with battery capacity. But the NexDock is 20 mm (0.78 inches), while my Lumia 950 measures just 8.2 mm thick. Wouldn’t it be possible to design a custom NexDock with a phone bay that my phone could slide into, and be powered by? Call it a “laptop sleeve,” maybe. Start thinking along those lines, and you can see what Microsoft might be sketching out on its own drawing boards. Imagine a $200 Surface Sleeve, a NexDock-like laptop shell that a Lumia or Surface phone could slide into. Or think about making NexDocks cheap: thirty, forty bucks, about the price of a keyboard. Who steals a keyboard? Don’t think of the NexDock as a high-value product, but as something semi-disposable, the next iteration of a smartphone case. Let existing smartphone case makers diversify into this new market, and design “sleeves” for specific models of phones. Eventually, you could see ruggedized versions, branded versions, personalized versions—or just generic laptop sleeves that you’re not worried about losing. That’s basically the future that NexDock has sketched out for itself, only with front-facing USB-C docks built into monitor stands. The two visions aren’t incompatible. This doesn’t mean that PCs or notebooks disappear, with their file systems, high-performance CPUs, complex apps—you name it. But even the Apple world is wrestling with the intersection of mobility and computing. A product like the NexDock helps bridge the gap.